administration and the Harper government’s Asia strategies. The multiplicity of states, increasing economic potential, and a general shift of power eastward have made the Asia-Pacific region vital to economic growth and military superiority in the 21st century. A consequence of the “Asia rising” narrative has quieted the human rights criticism of Asian states in general and China in particular. A prime example of this has been the forgotten plight of Tibet, which is rapidly being modernized and quietly being militarized by Beijing. From an influx of soldiers, settlers, and weapons, China’s military plans in Tibet should unnerve policymakers and human rights advocates in Western capitals. Tibet today is a very different place from the territory forcibly occupied (or liberated, as China puts it) in 1951. Development has advanced rapidly, and a once desolate terrain now boasts glistening runways and railways. Tibet has gone from having no roads in 1951 to 58,000 kilometers of them today. While the Tibet Autonomous Region has grown economically, this has come with a military build-up along its vast territory. The stationing of thousands of troops, military outposts, and even nuclear weapons in Tibet has provoked caustic protests from Tibetans and has unsettled China’s neighbors, hastening the arms race across Asia. Beijing’s official justification for the vast projects in Tibet is developmental in nature: Tibet, the logic goes, is underdeveloped and requires mass subsidization by the central government. It is true that Tibet’s gross domestic product has grown by double digits over the past two decades; however, the aggressive construction of air, road, and rail networks suggests a more military dimension to China’s projects. Journalists are not independently allowed into Tibet and official figures are rarely published other than to glorify Tibetan development. However, from reports and conversations with senior Tibetan officials, the militarization of Tibet has become undeniable. The recently completed 1,118 km Qinghai-Tibet Railway, numerous high-speed road networks, five major highways, and at least three airfields in Tibet serve both civilian and military purposes and allow China to project power forward, not least right into India. There are now an estimated 250,000 PLA troops stationed in and around Tibet and China has the capability to raise 30,000 soldiers in a mere 20 days. Already four times this year, the PLA has conducted military exercises in Tibet to test for battle readiness. Many of the soldiers enforcing strict Communist policies across Tibet suffer from mental disorders after the harrowing experience of trying to subjugate those Tibetans who resist Chinese authority. An army manual unearthed in May by the Tibetan Centre for Human Rights and Democracy offered advice to soldiers suffering post traumatic stress disorder and depression. “How should you deal with flashbacks of brutal episodes?” one section is titled, referring to one of the many self-immolations in Tibet. More dangerous than the troops are the weapons in Tibet. In 1971, China first introduced nuclear weapons in the Tibetan territory, and since then is believed to have maintained this policy. Using commercial satellite photos, the Federation of American Scientists calculated that sixty launch pads for nuclear ballistic missiles were located in central China. In its own reports, the Tibetan government-in-exile in India concluded that the PLA had seventeen top-secret radar stations, eight missile bases, and a variety of medium range and intercontinental ballistic missiles in Tibet, some of which are capable of carrying nuclear warheads. While this new military-intelligence complex has slipped under the radar of international politics, it has frightened China’s neighbors. The last time Tibet faired prominently in Western discussions of human rights was during the Beijing Olympics. 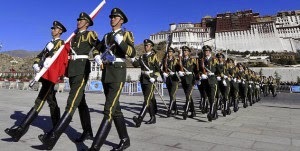 The human rights situation in Tibet is indeed grave, but now, this widespread conversion of Tibet from a Buddhist haven to a de facto military enterprise has the potential to threaten the national interests not only of Western countries but Asian ones. The U.S. and its allies would be wise to address the Tibetan situation before it provokes even more dangerous measures from Asian states nervous of China’s rise. NOTE-- Omer Aziz is a writer and journalist based in Toronto. The above article was initially published by The Globe and Mail.